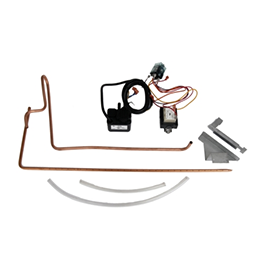 This kit removes most condensate generated during heat pump operation by transferring it to the indoor coil. The warm coil surface and warm room air evaporate the condensate, while adding humidity to the room. This kit decreases the sensible heating capacity of the unit and is not intended for use in seacoast or corrosive environments. NOTE: Under some high-humidity operating conditions, this kit may not be able to remove all condensate produced, and condensate could drip from the outside of the wall sleeve. To prevent this, a drain system (including factory-approved drain kit for the wall sleeve) should be installed. Can be Factory Installed using Feature Code - P.
Amana® is a registered trademark of Maytag Corporation or its related companies and is used under license. All rights reserved. Copyright © 2018 Goodman Company, L.P. Duplication in part or in whole is strictly prohibited.